YES! It feels so good to be back in the swing of things with The Tzniut Project. Big shocker here: The first installment of The Tzniut Project 2.0 comes from a man, and a Chassidic man living in Israel, no less. I've had gobs of inquiries and sent out the questions to many, so stay tuned for this exciting, fun, insightful series redux. 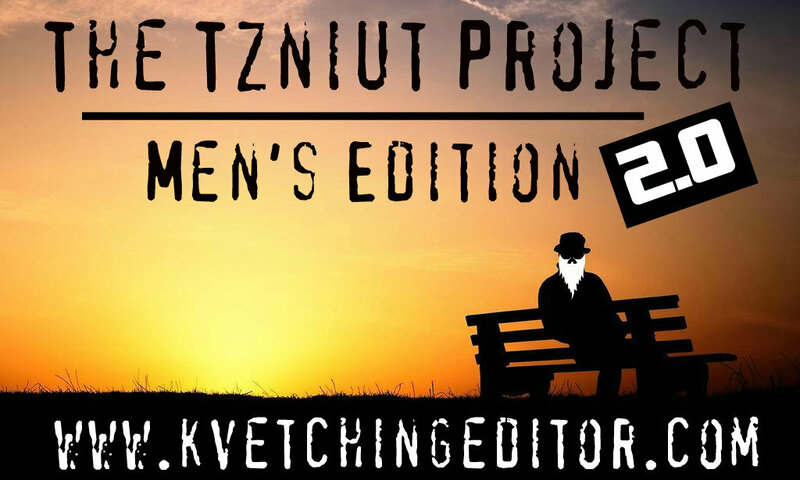 This is the first in the Men's Edition of a multi-part series called The Tzniut Project 2.0. For the Men's Edition, men from a variety of backgrounds with a variety of observances have volunteered to anonymously answer questions that I have written about their practices, people's assumptions, and more. In this particular post, I have tried to clarify Yiddish terminology and otherwise uncommon words through parenthetical statements and translations to the best of my ability to make the post accessible to individuals of every level of understanding and observance. Enjoy! 1. How do you affiliate Jewishly? Both my wife and I come from non-religious homes and today associate with the "Chassidic world" in Eretz Yisrael. We have a rebbe (teacher/mentor) and [follow] Chassidus, and we chose to send our children to Yiddish-speaking Chassidic schools. Our outlook and the Rabbonim (rabbis) from whom we learn and take our advice are Charedi (often translated as "ultra Orthodox" externally). 2. I say modesty or tzniut (also written tznius) … what does that mean to you? Do you think tzniut is a concept that is largely geared toward women? Tznius is a requirement of Hakodesh Boruch Hu (G-d) for Klal (all of the nation of) Yisrael, both male and female equally. The concept of modesty has, of course, both internal and external aspects, yet it is only when the external are a manifestation of the deeply rooted internal understanding and acceptance of tznius that we truly serve HaShem through our modesty. The Jewish people have a covenant with the Creator of the world. Our holiness and our greatness is guarded by furthering our understanding of HaShem and His Oneness. When we understand that HaShem rules over the world and there is no thought or action that He does not see, we understand that we must conduct ourselves according to His Torah and Will. However, when we understand the oneness of HaShem, and that every moment and every second of the day is an intimate experience of Him and a furthering of our relationship with him, then we understand how our thoughts, words and action impact this reality and this relationship. Not one thought escapes HaShem; we are always bound up with him and always with Him — whether walking in the market or sitting in the shul. Walking to Shabbos services is as much an a avodah (task or activity) as participating in them because we are never seperate from HaShem. Therefore, we see that every moment is special and our modesty is not limited to a physical checklist of elbows, knees, and what-have-you. Modesty requires us to guard our thoughts from lewdness, to guard our eyes from immodesty, not to listen to foul language or lewd jokes — to be a holy and sacred nation unto HaShem Yisborach (may He be blessed). Not only that but when we consider the oneness of G-d and His constant involvement in the world, which he granted us, as a corridor to the next world, we begin to realise that our time is not our time, our thoughts are not our thoughts, our outfit is not our outfit — it is all granted to us, only to enable us to make the right decisions to come closer to G-d in this world and earn a place in the world to come. 3. Growing up, did your father or grandfather (or any other male role models in your life) dress modestly in any way? Do you think modesty was something instilled in you by your family? I couldn't have lived in a less modest environment. My family were not actively immodest, yet secular society puts very little empthasis on the values of modesty and thus while people aren't actively pursuing immorality/immodest, it is all mixed in with daily life. A friend down the street from us had an aunt who was a nun, she went with the whole levush (in Yiddish this refers to regimented dress) and none of us could get our head around such a young woman giving up everything for G-d and wearing such a funny outfit ... l'havdil (this word is about making a distinction), fast forward ten years [to us]! My wife and I are both dedicated to upholding the Torah requirements of modesty in every way we can. If we ever come to a place of disagreement, we let the Rov (rabbi) be the final say — this can come about in how we dress the kids, for example. We both want emes (truth) — whatever the emes is, one of us will step down if we were mistaken. I wear normal chassidic dress of a long black coat and hat. This in itself is an act of modesty that we all blend together, not one of us needing to stand out — becoming consumed in the oneness of HaShem. That doesn't mean we don't have individuality. 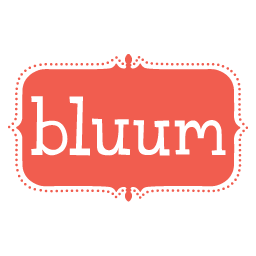 Anyone that has experienced a frum (religious) community knows there is more personality there than anywhere else on earth, but the need to stand out is erased, and we blend in together, bustling along to serve HaShem day in and day out. On Shabbos I wear a bekishe (long coat) and shtreimel (a special fur hat) l'kavod Shabbos (to honor Shabbat). 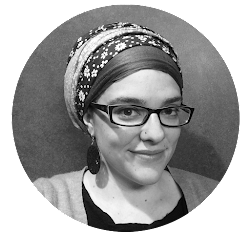 My wife does not wear a sheitel (wig) and covers all of her hair either with turbans, snoods, or tichel (scarf, also called a mitpacha in Hebrew) depending on the occasion. My wife took on herself to wear tights with a minimum of 70 deniar (this refers to the thickness of the yarn/weave) that are not skin colored. These are common things in the charedi world, and she doesn't stand out from the norm. We for sure get pigeonholed outside of the charedi world. One bonus of the beard and getup is that people often assume I don't speak English, so more often that not I get to hear what people really think of me in public (haha). The truth is I don't wear anything to distinguish me to one group or another, and thus I get the charedi label. More often that not we hear non-charedi chevreh (people) in the queue behind us ask such things as, "Do you think she shaves her head?" or "Isn't he HOT in that coat," in which case I normally turn around and ask for the time in a beautiful British accent, to ensure they don't stray into questions that could cause them embarrassment when one of us later answers the phone in English. I think continuity is the key — one needs to make a true assessment as to what they believe is ratzon HaShem (the will of G-d) and then do that, even with great mesirus nefesh (self sacrifice) if necessary. For this reason I don't fluctuate up or down much. Life is a journey, and the journey is a relationship with HaShem — if I know the person is actively having a relationship with HaShem, even though they may currently not be doing His ratzon (will) — I don't know their journey, I don't know their tests and problems in life. For this reason I try and stay away from judgement. However for my own observance of tznius, I also try and stay away from areas where I know there will be a lack of tznius. Once by the kosel (Western Wall), my wife saw a Jewish woman arrive on Shabbos night, very "under dressed" (to say the least), carrying her iPhone and a pad of paper with a pen. She ripped off a piece of paper, wrote a kvittle (prayer), and stuck it in the wall (how many issurim [prohibitions] right there?!?) and then continued to daven (pray) with all her heart. Now it's easy to judge her — issur after issur (prohibition after prohibition). But it's also possible to see a Yiddisher neshama (Jewish soul) who gave up her Friday night to pray to G-d. We don't know what she has been through, what family HaShem had her born to, her Jewish education, etc. But we can see she gave up the Friday night bar for G-d. This is a relationship with HaShem. May it grow until she brings herself within side His ratzon (will). I truly believe that a thorough understanding of all the hashkofa and halochas of tznius (outlook and laws of modesty) are necessary for every man and woman. Then, one must spend significant time internalising them and turning them into a relationship with G-d. The author of this post included some suggested reading (in English) for people that he believes is insightful and beneficial. Please note that I haven't personally read any of these books and thus do not endorse them, but from the looks of things they all can provide guidance, inspiration, and lessons on tzanua. The author of this post also suggests Modesty: An Adornment for Life Day by Day and says that "this book must be learnt with your own local Rov (rabbi) to understand how to implement that which is relevant to you. It musn't be disqualifed as too frum (religious), chas v'shalom (G-d forbid), but not every person in every community, at every stage in life/Jewishness should try to do everything at once in this book. Stay tuned for the next installment of The Tzniut Project 2.0. If you want to participate, just send me an email at kvetching dot editor at gmail dot com. If you have questions for the blog author, please post them in the comments section or email me them if you'd rather function on a private plane.